Pelly Ruddock, Danny Hylton, Kazenga LuaLua and Luke Berry were all on target for Mick Harford's team at Kenilworth Road. That came after Barnsley, in second, needed a 90th-minute Jacob Brown goal to clinch a 1-0 win at Walsall at lunchtime. With Sunderland not in action today Pompey's win at Shrewsbury took them third, while fifth-placed Charlton were also without a game. 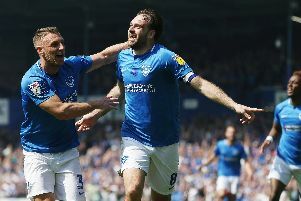 Peterborough moved sixth as goals by Marcus Maddison and Ben White earned a 2-0 home success over Southend, while Blackpool kept their play-off hopes alive with a 4-1 win at relegation-haunted Bradford, Armand Gnanduillet (2), Matty Virtue and Chris Taylor the scorers. Curtis Nelson got the only goal as Oxford sneaked a win at Coventry, while Burton were the division's top scorers of the day with a 5-2 home win over Accrington. Gillingham are in the top half thanks to a 4-2 win at AFC Wimbledon but Plymouth and Bristol Rovers had to be content with a point apiece from their 2-2 draw at Home Park. Rochdale did their survival hopes some good with a 3-1 home win against Scunthorpe but the battle to stay up remains as tough to call as ever with only six points separating the sides from 12th to 22nd. Most teams in the division now have just seven games to play.